This was a two-car hike. It was a nice but chilly day in the late fall, and most of the leaves had already fallen. We parked a car by Kakiat County Park off Route 202 near Suffern, and then drove the other car to the Reeves Meadow Parking area off of Seven Lakes Drive near Sloatsburg. We started at the Pine Meadow Trail, and went along the side of the brook to the Stony Brook Trail, and to the Kakiat Trail. 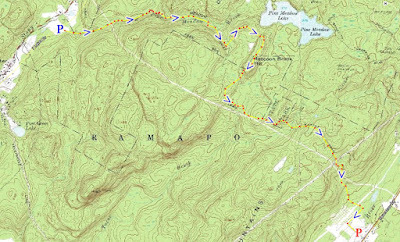 Followed along the Kakiat Trail all the way up to the intersection of the RBH Trail, and then climbed the Raccoon Brook Hill for an excellent view of Pine Meadow Lake and the eastern ridge of the Ramapo Mountains. Continued to the end of the RBH Trail back to the Kakiat Trail, and continued along the Kakiat Trail all the way back to Kakiat Park where we picked up the second car. Beginning of Raccoon Brook Hill. On top of Raccoon Brook Hill. Facing north towards Diamond Mountain. Same view as above, zoomed in. Me at the top of Raccoon Brook Hill facing Diamond Mnt. Pine Meadow Lake from Raccoon Brook Hill. Looking towards the Ramapo Escarpment. Facing east from Raccoon Brook Hill. Same view as above facing North. Above descent of Raccoon Brook Hill. Facing South towards the Torne Valley. Same view as above, with different lighting.